When is Turkey Trot Los Angeles? Turkey Trot Los Angeles will take place on Thursday, November 22, 2018. Packet pick up opens at 6:45 a.m. The 5k starts at 8:00 a.m.
How Do I register for Turkey Trot Los Angeles? You can register online at www.active.com or on Thursday (race day) at 200 Spring Street (in front of City Hall) if space is available! When and where can I pick up my race bib and items? You can pick up your race items at our pre race packet pick up or you can pick them up on race morning, beginning at 6:45 a.m.
For Packet Pick Up, you must present the confirmation email and one form of acceptable photo ID. Your confirmation email is sent to you when you register and your bib number will be sent out race week. If you are picking up a packet for a friend or family member, be sure to have a photo of their ID on your phone or a hard copy along with their bib number. What if I want to run the 5k and 10k events? You can run both the 5k and 10k events BUT you must finish your 5k within 45 minutes to join the start of the 10k @ 8:45 a.m.! Also, you must be registered for both events. You can do so by selecting the “combo” option during only registration. Can I walk or do I have to run the entire distance? You can walk, run, moon walk or skip. Just come out and have some fun with us! YES! The top 3 in each age division for the 5k and 10k will receive awards. YES! Thanksgiving is all about family. If your child will be running or walking the course (even just parts of it), they must be registered though. If your child would like to receive a t-shirt, medal, and bib, they also must be registered. Is the Widdle Wobble 1k timed? The kids runs have a race clock, but participants are not individually timed. If my child is participating in the Widdle Wobble, can I run along side them? YES! 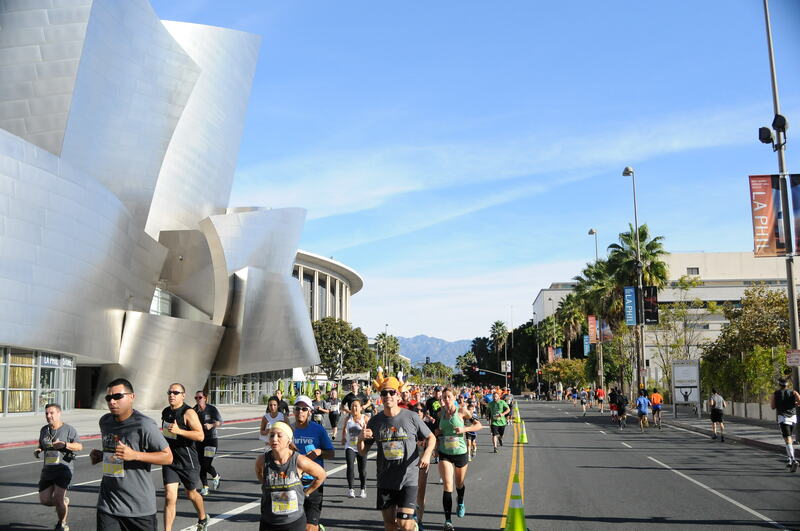 There are plenty of restrooms located at the start and finish areas on 1st Street, next to Registration (between City Hall and the LAPD building). No. If you bring valuables, we recommend carrying them in a small bag with you on the run. We are encouraging everyone to take the METRO. There is a stop at Grand Park. For only $3.50 (+$1 for a TAP Card) you can ride down to the race and back using the Metro Red or Purple Lines (and don’t have to worry about parking)! Parking will cost $9.00 and you must arrive by 8:00am. Can I ride my scooter, skateboard or bike? How much does the event cost to enter? 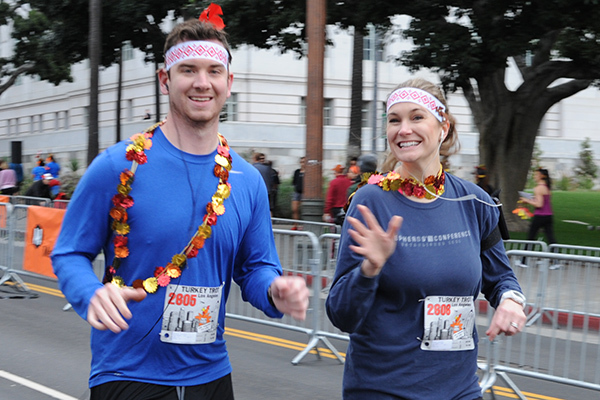 Entry fees can be found at the REGISTRATION page at www.turkeytrot.la. Your fee for the Turkey Trot Los Angeles covers all Turkey Trot LA race and administrative expenses. To support the mission of The Midnight Mission, please consider adding an additional donation to your payment when you register for the race. Direct donations can also be made at https://app.mobilecause.com/vf/TROT. Transfer Policy – There is no charge to transfer your race fee to another race owned and produced by Generic Events. Registration must be open to transfer. This option is available until November 17, 2018. Please note there is a small Active.com processing fee. No Show Policy – Generic Events does not authorize refunds at any time. If you are unable to attend the event and/or do not show up for the event, your entry spot and race items will be released and sold to event day registrants. Included registration items such as medals, t-shirts, and hats will not be mailed to participants who do not participate in the event they signed up for. Please review the transfer policy above if you are interested in transferring your registration to a different event or person. 3. Race courses and race date will be altered as seen fit by race management and the City of Los Angeles.